This has been a long day. I started cooking and baking yesterday and finally sat down this evening. Everything turned out great thankfully and I even had time to do a a craft with my two kids. Index cards, glitter and ribbon can make great place cards and my kids had a blast helping me make them. I am also happy to report that my first gluten free Thanksgiving went off without hitch. My gluten free pie crust was wonderful and the coffee cake muffins I made for breakfast were delicious. I went non-traditional and made Cornish game hens instead of turkey and my two boys devoured them. They were definitely a hit. Now that I have made Thanksgiving gluten free I am much more confident with my gluten free baking skills and I feel so relaxed. It was great Thanksgiving. Gluten free baking can be hit or miss. Sometimes things turn out great and other times they are a disaster. 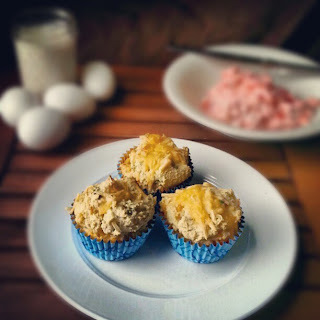 Recently I tried a new recipe for Cheddar-Chive Corn Muffins from the December issue of Food and Wine which I made into a gluten free breakfast for my family. This recipe has 13 ingredients. It takes 30 minutes of total time, 10 minutes of which is active and makes 12 muffins. I had no problems finding any of the ingredients at my local grocery store. I chose to use red pepper jelly since that was the variety available at the store I shopped at. Instead of the 1 1/2 cups of all-purpose flour I used a gluten free all-purpose flour that uses coconut flour. I also used muffin liners since gluten free muffins tend to fall apart easier than those with gluten. Finally, I ended up with 15 muffins instead of the 12 stated by the recipe. I followed the remainder of the recipe. The pepper jelly/cream cheese spread in this recipe was delicious. I served the leftover jelly with crackers and it made a great spread. The muffins turned out well, they rose effectively and were not dry like a lot of gluten free recipes can be. The cheese made the muffins savory and slightly sweet, with the pepper jelly making a great compliment. For the recipe go to Cheddar Chive Corn Muffins. Well they look delicious! I have friends that are on total gluten free diets. This would be a real treat for them. Thanks for sharing. Thanks :) They really are delicious and very easy! I followed you back! Terrific recipe for this time of year! I agree :) I make a lot of muffin recipes during the fall and winter. They are great to accompany soups and stews.